It’s been a rough couple of weeks for pedestrians and cyclists in the Bay Area. On Monday, we brought you the sad story of a woman in a wheel chair run over and killed on Market Street and a woman in Berkeley who barely survived getting hit by a car on Fulton Street. Yesterday word came down about another possible road-rage-hit-and-run on a cyclist, this one on Russian Hill. There were also hit-and-run deaths in San Jose. A few weeks ago, Janice Li, advocacy director of the San Francisco Bicycle Coalition, took Streetsblog on a tour of the Wiggle and Market Street bike infrastructure. It’s a work in progress for sure; SFMTA is using Market Street as a test bed for different treatments for protected and raised bike lanes. What does this have to do with the latest spate of hit and runs? The “broken windows” theory of policing addresses this: If a society says it’s okay to break small rules, then it invites people to break larger ones. In other words, allowing cars to park on safety measures, such as bike lanes and crosswalks, sends a clear message that it’s acceptable for motorists to put cyclists and pedestrians in danger. But if parking dangerously is the start of a problem, maybe it’s also the start of a solution. Scold an individual who parks on a bike lane, and you’re probably not going to accomplish much. Chastise a cop who does it and you’ll get nowhere. But if it’s a commercial vehicle, sometimes–just sometimes–it might make a difference. Thank you for sending the pictures with the date and time stamp. DHL takes the safety of our employees, and the general public, very seriously. Our employee’s disregard for the law and the bicyclists traveling on Market St. will not be tolerated. I provided the Station Manager the pictures you sent. He is an avid biker and immediately got to work researching which courier was on Market St on that day and time. He will take appropriate action with this employee and he will address at the courier meetings for all employees to be notified of the proper use of the bike lane. I apologize for this behavior and assure you we are working to make sure this does not happen again. Thank you for providing us with the information and pictures. Please feel free to contact me. Let’s not be naive: DHL’s employee may not care at all about vulnerable road users, but that doesn’t matter. A business, large or small, has to care about its reputation, because that hits the bottom line. 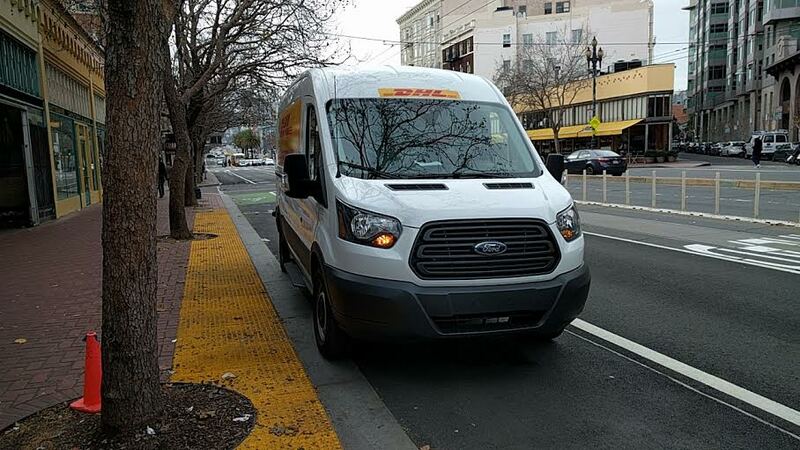 If every cyclist in the Bay Area got mad and refused to use DHL, they would have a problem. Certainly, all advocates for safe streets must continue to lobby politicians, push for legislation and organize protest rides, marches and vigils. But maybe getting drivers of commercial vehicles to be safe is something we can all work on: one photo and one email at a time. I dont understand why cant bike lanes be made on sidewalks instead of streets. Problem solved.